Hi everyone! 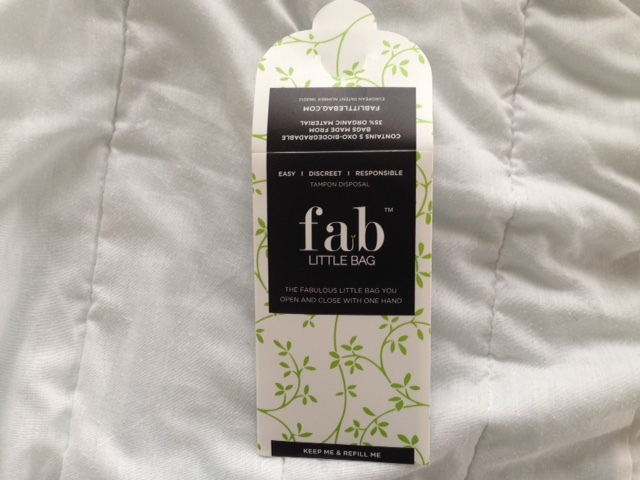 Today I am going to be talking about the ‘FabLittleBag’. If you don’t know, it’s a small bag that you use to dispose of your tampons, sanitary towels or feminine wipes discreetly. There are two types sold worldwide by Fab little bag and i’m going to be talking about them below. The reason i’m reviewing this product is actually because of my December dollibox review. The wonderful owner of Fablittlebag (Martha) got in touch with me because I had missed January’s box and asked if I wanted to review some of the products and I did! I also know it’s not really fitting to my blog but, I truly feel a message needs to be spread about this product and if that means promoting something that’s not really ‘me’ to help young girls and other women then i’m all for it. I had already been looking at the products via somebody’s twitter (Can’t remember who, pro blogger right here!). I immediately thought how cool the product was and then when I was contacted by Martha I was so eager to try them out. I got sent both types of the product. The ‘Bathroom pack’ and the ‘Handbag Pack’. But Lauren, How Do They Work? Basically, it’s simple. They are both designed for discreet tampon, sanitary towel or sanitary wipe disposal without needing to flush them away or wrap them inside toilet roll. Let’s start with the ‘Bathroom pack‘. This pack is perfect to sit on top of your toilet or even in a drawer near the toilet. They are meant for home use but they can fill up the handbag pack (just keep reading!). The design is so simple and discreet and I wish these had been invented when I was a young teen. All you need is to open the bag with the finger loops provided, pop in whatever type of menstrual product you wish, easily un-peel the seal, close the bag shut, pop it in the bin and you’re done. There’s no awkward tampon or sanitary towel left lying around or bunched up in some toilet roll in your best friends bin, it’s gone! I love the handbag pack because it is re-usable and it’s perfect for school/work or even every day out and about-ness. Inside the handbag pack is 5 fab little bags that are looked after by the plastic carrier. It’s great because you can re-fill the plastic pack whenever you wish and when you’re not on your period it makes for great storage of your fablittlebags. The handbag pack is a sturdy plastic-like material that holds 5 fab little bags in place that is designed to withstand the rough and tumble of the interior of your handbag. It could hold more than five bags but, that’s what it comes with. It means you can take your bags out with you without them getting ripped or dirty in your handbag. Well, for one I think we have all had that one time a tampon or sanitary towel got stuck and wouldn’t flush. I know I have and I know a lot of my friends have. It’s so embarrassing and super unhygienic to stick your hand in the toilet bowl to retrieve a sopping mess. You then proceed to panic and then realise you’re going to have to flush again and it goes on from there. It’s even worse to have to leave it floating for somebody else to clean up. They are environmentally friendly, because there’s no need to flush they keep our oceans and rivers clean, something that won’t stay clean forever if we keep flushing things that shouldn’t be flushed. Not only that but, they just make your period that little bit better. I personally don’t think the fablittlebags have an age limit. I know they will probably appeal more to mums looking for something for their daughters but, truly anyone and everyone can use these. They take away that awful stress of having to find a bin for your tampon or sanitary towel, they take away the stress and guilt of flushing it and the ever longing worry that it didn’t flush and your dad’s going to walk in and find it still floating or worse, your friends dad. They can be discreetly taken to school or work. You can use them absolutely anywhere for discreet disposal. One of the best ideas is for girls heading to festivals, disgusting dirty portaloos are already rank without tampons floating around everywhere. 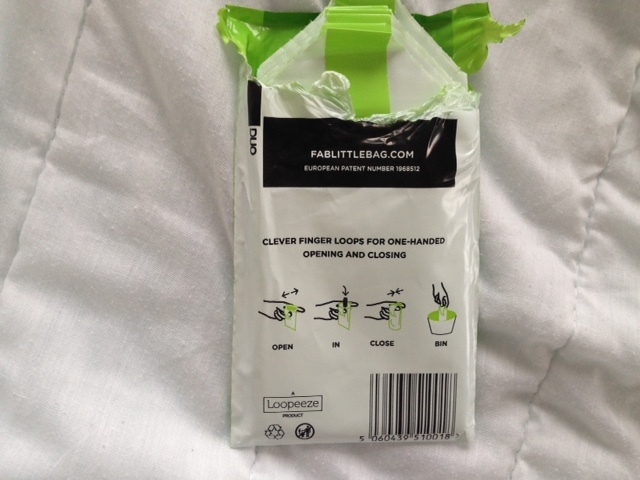 Using a fablittlebag you can literally dispose of it without causing other people to turn their noses up. If there’s not a bin…? Where I grew up the schools were pretty dirty, there were no mirrors on the toilet walls (due to an ‘incident’ a few years before I started the school) and there were no bins anywhere near the toilet or in the toilets. For me now as an adult, that isn’t a big deal, I would just take my bag out with me and dump it in the bins they provide next to the sinks but, sometimes when you’re 13 or even just not confident about your period, this can be so awkward. Of course this isn’t what you’re meant to do but, the bag seals up so it won’t fall in to your bag and it saves the awkwardness of finding a bin amidst the women crowding the sink. I think it’s pretty obvious I am completely sold on the idea. I think it’s fantastic for young girls who worry about disposing of tampons or sanitary towels. I think it’s great for women who worry about the same thing. I think they’re great for girls heading to festivals or camping trips where it’s just not an option to fling your tampon down the toilet. It’s so much more hygienic, it’s amazing for the environment and it makes the lives of everyone better. Right down the lives of cleaners who have to empty the bins. Fablittlebag is revolutionary and everyone should have some stored away, they are just brilliant because they mean everyone’s worst nightmare fretting about disposal is over. Another amazing thing about the fablittlebag that should be screamed about is toxic shock syndrome. Toxic shock is a virus contracted by the use of tampons and leaving them in too long can be one of the biggest causes. Toxic shock is potentially deathly and I know for sure I would leave mine in way too long if it was too awkward to dispose of and I know i’m not alone in doing so. Fablittlebags stop that worry so you can change it every few hours when you wish. So, aside from all of the other absolutely amazing benefits we could be saving hundreds of lives by spreading the message and getting these bags a necessity rather than a luxury. Since I got sent this product I did think the shipping would be slow but, Martha (the creator) sent me the bags to SPAIN within literally a few days, there is shipping available all over the world and the bags are available online by clicking here and in the popular UK supermarket ‘Waitrose’ and the online supermarket ‘ocado.com’. 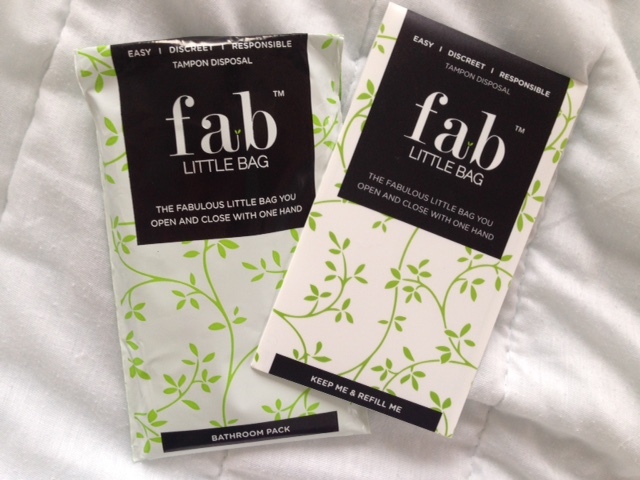 Thank you so much for reading my review of the fablittlebag, if you did enjoy it please let me know in the comments below. If anyone from fablittlebag (including Martha) is reading this, thank you so much for sending me the two packs. I am so in love with them and I wish you every success.